Stop Outbreaks Now :. What Is Silvis Seal? 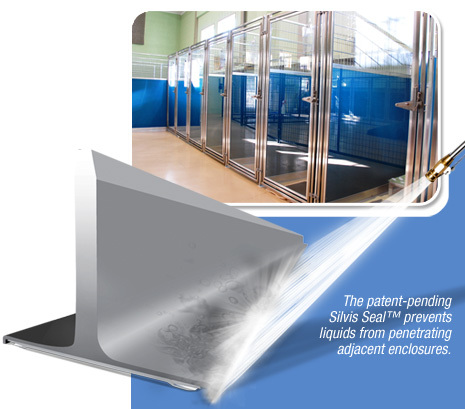 Developed in direct response to customer need, the exclusive Silvis Seal™ barrier provides an entirely new approach to prevent dangerous cross-contamination between kennels. The exclusive Silvis Seal™ barrier provides an entirely new approach to prevent dangerous cross-contamination between runs. Available only on Mason Company’s Sani-Kennel systems, the unique Silvis Seal system functions like a dam to create the ultimate watertight, reliable and long-term seal that stops fluid and contaminants from migrating between kennel enclosures. Provides the ultimate solid watertight kennel underneath division panels to ensure a one-of-a-kind layer of protection. Reconfigures the floor stop to prevent cross-contamination even when the primary bead of floor sealant has been breached or where there are cracks, waves, irregularities or other imperfections in the floor. Is able to tolerate harsh cleaning agents such as chlorine bleach and ammonia, and withstands the force of pressure washing systems. For information on technical specifications click here.